Put down the slippers & pick up the latest technology. Mother’s Day is right around the corner, and many are searching for the perfect gift. A #1 MOM mug, dried noodle necklace or card with your finger-painted hand-print aren’t quite acceptable gifts from the adult child. Flowers and chocolates are a common go-to, but what if your mom lives in a Senior Living Community? Flowers and chocolates may spoil in her apartment, leaving a mess for her or the staff to handle. Here are some gift ideas that will warm your mom’s heart while increasing her quality of life in Assisted Living, or any senior living community. Technology, a sometimes-scary word for the aging adult. Fear not, we have ideas for simple technology products that mom may love. Technology is constantly evolving, so these products require some research before purchasing, but they’re worth investigating. Digital Photo Frame: If your mom lives in a Senior Living Community, it’s likely that she took the steps to downsize into a studio, one or two-bedroom villa or apartment. Boxes of photo albums are heavy and occupy valuable space, so they end up in closets, storage units or given to children. A digital photo frame adds a nice décor touch, provides a sense of home and gives mom daily access to photos of family members without the inconvenience of housing stacks of dusty photo albums. For the mom suffering with Alzheimer’s disease (early and late stages), visual aids, especially family photos, help stimulate memories. Family photos can help mom reminisce about pleasant family memories while also serving as an aid in engaging in the present and recalling loved ones currently in her life. Wi-Fi digital frames like the Nixplay Wi-Fi Cloud Frames are user friendly and don’t require memory sticks or cards. Your photos appear in this digital frame almost magically (well, the magic of Wi-Fi). Don’t stress about loading all the photos into the frame before gifting it to mom. Wi-Fi digital frames allow you to instantly receive and display images through a variety of methods, including email and the Nixplay mobile app. If you live miles away, you’ll still have access to manage and send photos to mom quickly and easily at any time. She won’t have to worry about turning it on or off either, since the smart motion sensor does all the work. As if this piece of technology wasn’t user-friendly enough, it now offers the option to sync with an Alexa device, which means the frame can be managed hands free! There are several other Wi-Fi photo frame brands from which to choose, so do a little research and find one your mom would like best. Fitness Tracker: Whether your mom is still living at home, in Independent Living or Assisted Living, an easy-to-use fitness tracker is a great Mother’s Day gift idea. 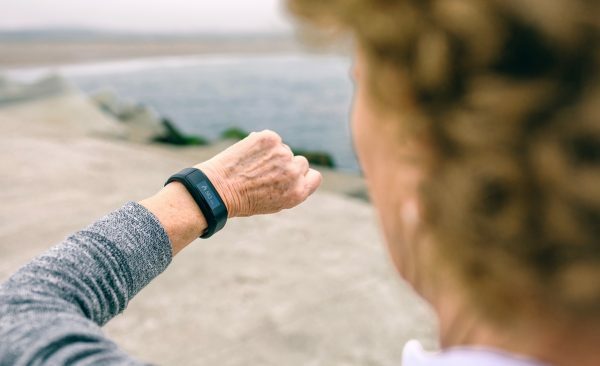 With evolving fitness trackers and diet apps, health and fitness awareness is on the rise, and seniors shouldn’t be left out of the movement. Ease of use is the most important factor in selecting a fitness tracker. The last thing mom needs is a high-tech fitness watch that requires frequent charging and complicated instructions. A simple fitness tracker such as the Garmin Vivofit Fitness Band will do just the trick to tracking her fitness! Long battery life: This is one of the most important factors! This tracker boasts a 1+ year battery life. Talk about easy! Your mom won’t have to worry about low battery alerts or charging. You can help her change the battery once a year. Water resistant: Water aerobics, showers, spills and playful grandchildren. This tracker can handle it all, erasing one more item from the worry list. Tracking: The Vivofit tracks daily steps, calories and distance and it monitors sleep. Keeps mom moving: This tracker has a red move bar that displays after one hour of inactivity, and the red bar grows when sitting too long. After a few minutes of walking, the bar resets. What a great reminder for an aging parent! There are a variety of other fitness trackers on the market, including several versions of Fitbit trackers that you might prefer for your mom. The possibilities are endless! Echo Show: you’ve heard of Amazon’s virtual assistant, Alexa, but how about the Echo Show? This technology product brings Alexa to life with visuals. View weather reports, security cameras, photos, videos and more, hands-free- just ask! Mom can easily make hands-free calls and video calls to stay in touch with loved ones. It’s the perfect gift for the mom who lives long distance from family and friends. Continually adding new features, the Echo Show is worth researching. Buffalo Crossings Assisted Living in The Villages is currently piloting this product at their community to gauge resident interest and learn if it adds value to their lives. Visit their website soon for an update! Locator mobile apps: While most of these mobile apps are free, a Mother’s Day gift could simply be the time you spend installing the app on your mom’s smart phone. From there, this is the gift that keeps on giving. Apps such as Life360 Family Locator, rated 4.8 out 5 stars by over 100K users, allows you to track friends and family members to ensure their safety. If mom agrees to have this app installed on her phone, you’re able to receive notifications when she comes and goes from shopping, doctor’s appointments and social events. You’ll have peace of mind knowing she has safely arrived at her destinations without calling to check in on her every hour. 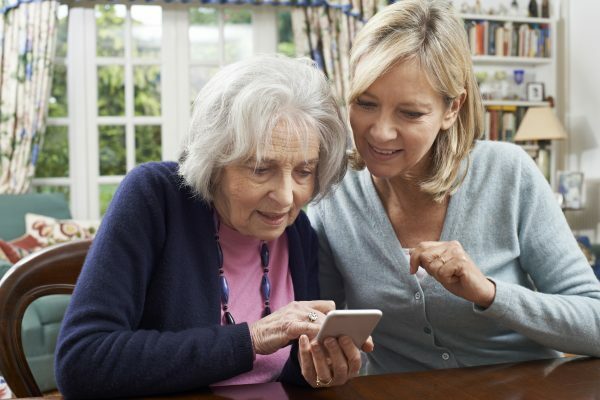 Apps like this might be better suited for a mom still living in her home or in an Independent Living Community, but hey, it’s free- give it a try! Wireless item locator: How many times have we all misplaced our keys or even the television remote? Too many times to remember! This is a great gift for an aging mom, or any mom for that matter. Products like the Esky Wireless RF Item Locator are perfect for avoiding being late to a doctor’s appointment or outing due to misplaced keys. With multiple receivers to attach to keys, eyeglass cases, wallets and other important items, and a color-coded remote control, this gadget couldn’t be more user friendly. Your Mother’s Day gift doesn’t have to require batteries. There are several more traditional options for a mom in a Senior Living Community that will still enhance her lifestyle. Medical alert lanyard: Replace mom’s white cord with a stylish necklace that securely holds her alert device. 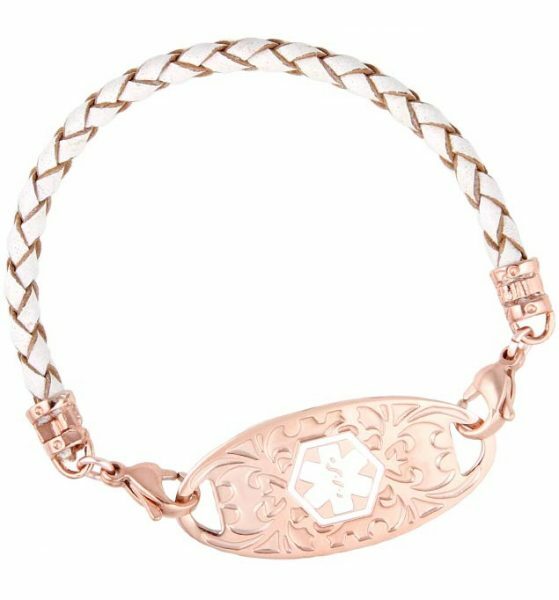 Medical ID bracelet: There are several online companies that sell bracelets and necklaces with custom engraving options to list allergies, illnesses and vital information for emergency professionals. Laurens Hope Medical ID Jewelry has a wide selection of options. Gift cards to use at home: Your mom might call a Senior Living Community home. In that case, ask her community if you can purchase a gift card for the in-house salon. Treat her with a complimentary manicure or pedicure. Or, prepay for an outing on the activities calendar. Speak with the administrator or activities director to discuss options for purchasing a ticket to an upcoming event they’re planning, such as a movie or trip to the aquarium. Most assisted living communities have a full calendar of planned outings! What’s most important is making mom feel special on Mother’s Day, regardless of where she lives. With a little planning and research, you can find the perfect gift for your mom for every stage of her life. If all else fails, quality time with your mom will go a long way. A scenic walk, picnic or quiet tea time can still warm a mother’s heart.